Exciting stuff! 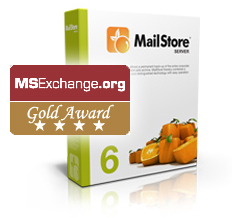 One of the leading Exchange resource sites today published a glowing review of MailStore giving it the highest category of praise and their coveted Gold award. The author J. Peter Bruzzes, who’s an MVP and director of Exclusively Exchange gave a summary of the install process in his test lab environment. Not that we had any doubts, but we were extremely pleased to read his subsequent feedback which included quotes such as “I liked MailStore Server. I liked it a lot because it was incredibly easy-to-use, extremely flexible, reasonably priced and well supported”. In addition Bruzzese commented that “the installation couldn’t have gone any smoother” and that he liked the well structured server configuration side. Besides the compliance options he also liked the information provided online such as the manual, implementation guides and help articles. At one point he does raise the point of of why MailStore Server might be preferred over the Exchange 2010 built-in archive features, and upon querying this with developer deepInvent Software GmbH, they pointed out that Single Instance Store is missing in Exchange 2010, leaving him to comment “With MailStore Server Single Instance Storage remains and that will reduce storage requirements”. We’re over the moon to see the feedback in the press echo our own justifications for choosing to include the product in our portfolio. If you’d like to see what all the fuss is about for yourself, download the fully functional trial from our main Web site here. ← Remote support tools: Which of them do you prefer?